Sorry to disappoint any fans expecting the SEGA Forever series to be literally faithful to its name, as there were only ever 897 Genesis/Mega Drive games published, and only a proportion actually developed by the Japanese company themselves. SEGA Forever – more like SEGA Seventeen Years, am I right? In SEGA’s defense, they have released so many titles under this new moniker on the App Store that I can’t even remember if I’ve made this awful joke before, so apologies if my terrible humor has started to get stale. 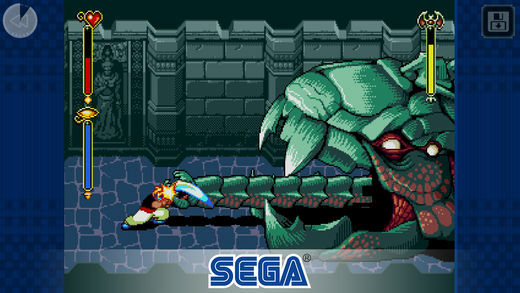 Anyway, another week, another new SEGA Forever game, and this time around it’s the short but sweet action RPG Beyond Oasis (Free). In the game, your protagonist comes equipped with a magical Armlet, which can harness the powers of certain elemental spirits encountered on your travels. Beyond Oasis is definitely one of the strongest of SEGA’s back catalogue, and is available to download today for free on the App Store. Coincidentally, Beyond Oasis was released in the United States exactly a year before I was born. However, despite being somewhat before my time, the game has caught my eye in the past from its previous re-release on the Wii Virtual Console service. Beyond Oasis is a beautifully vibrant SEGA alternative to adventure games like The Legend of Zelda: A Link To The Past, and features some sprawling and quite literally epic bosses in a far more combat-centric fare to Nintendo’s action series. Even though the game is over twenty years old at this point, it is still an enjoyable experience to tackle today, and hopefully Beyond Oasis continues the gradual improvement of the emulation that we’ve seen in the SEGA Forever games over the past few weeks. While you’ll likely not be waiting forever for an official TouchArcade review of Beyond Oasis, I’d recommend checking out Shaun’s excellent spotlight post on his personal site, and let us know your own thoughts on the game in our forum thread.